What is the Bicycle Referendum all about? More and more people in Munich use bicycles as a means of transport. 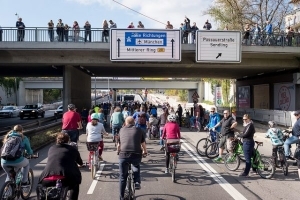 However, despite years of promises to turn Munich into a “bicycle capital”, the bicycle infrastructure has not been improved sufficiently. Safe, wide, and convenient cycling paths? A city-wide, continuous, and dense cycling network? Safe, uncomplicated, and stress-free intersections and junctions? Safe, well-distributed bicycle parking available where it’s needed most? An area-efficient and socially equitable distribution of public space? Then join in and help! 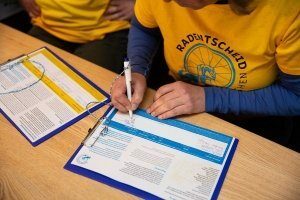 We are very happy that so many highly motivated citizens and Alliance Partners have joined the Bicycle Referendum. To power through quickly to our goals, we are glad of every additional helper! Alliance Partners are supporting us. Collection points displayed on the map. Bicycle Ambassadors are helping us. Participants at the bicycle rally. What have we planned next? Wheels are turning! 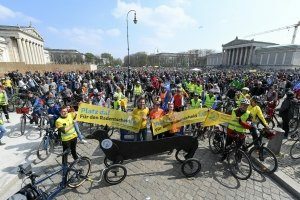 Our Bicycle Rally enticed 15,000 participants into the streets and we managed to fill the entire Altstadtring (Downtown Ring). 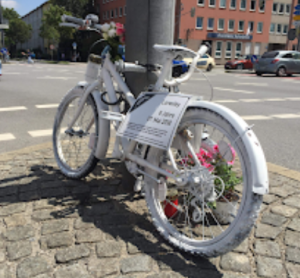 A “Ride of Silence” commemorates cyclists injured or killed in traffic. We’re going all the way and are planning another huge event for the final stretch of signing.